Perched on a stool surrounded by metal working tools, Emily Triplett turns a piece of gold over on a rolling mill to roll the metal down into a specific shape. 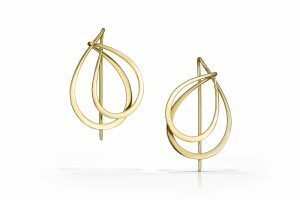 She’s creating a set of gold hoop earrings, one of her favorite styles. Next, she will form the metal and hammer the surface, before finally bringing the jewelry to a high polish with sandpaper and plenty of elbow grease. 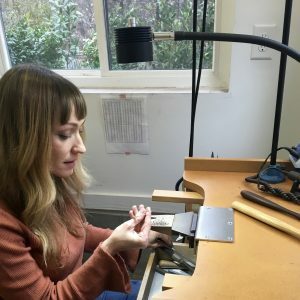 It’s all in a day’s work for Emily Triplett, a metalsmith and the owner of a handmade jewelry business based in Chapel Hill. She’s been working on her own from a studio attached to her house for the past five years. The mother of a seven month old, she spends about 20 hours a week designing and creating high quality jewelry. Her goal is to create pieces that that fits into her clients’ everyday lives. She has a growing portfolio of work, ranging from earrings and necklaces to custom engagement rings. Her work is featured in several boutiques, like Light Art + Design located in downtown Chapel Hill on West Rosemary Street, and craft shows throughout North Carolina. At the beginning of her career, she would have never envisioned herself owning a jewelry studio. She planned on doing nonprofit work after graduating from the University of California at Santa Cruz with what she calls a “hippie degree” in community studies. Her transition to being a metalsmith started with a job offer from her friend who was a stop motion animation puppet maker. She worked on projects with foam and carved materials to create tiny aspects of the puppets. Painting or drawing never appealed to Triplett, and she soon realized her passion for working with her hands. She started taking jewelry-making classes and designing her first pieces. Inspiration can be difficult to find, especially when working for yourself, she said. Aesthetically, she finds inspiration in modernist form and art deco jewelry. Her biggest source of inspiration is the journey of designing a piece.